New Super Mario Bros. Wii is a side-scrolling platform video game published and developed by Nintendo for the Wii. It is the first game in the Mario main series since the Mario Bros. arcade game to feature simultaneous multiplayer gameplay, and the first title to include Nintendo's new 'Super Guide' feature. The game’s plot is similar to those of other side-scrolling Mario games. 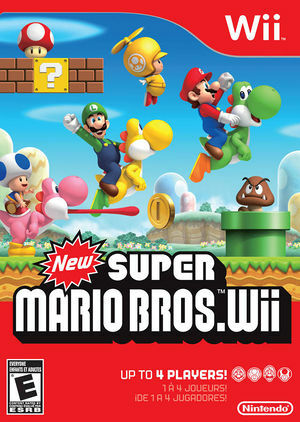 New Super Mario Bros. Wii follows Mario as he fights his way through Bowser’s henchmen to rescue Princess Peach. Mario has access to several power-ups that help him complete his quest, including the Ice Flower, the Fire Flower, and the Starman, each giving him unique abilities. While traveling through up to nine worlds with a total of 88 levels, Mario must defeat Bowser's children, the Koopalings and Bowser Jr., and Bowser himself before finally saving Princess Peach. 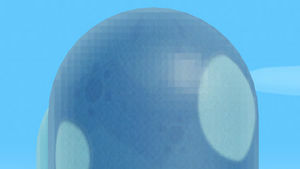 At higher internal resolutions, shading will look weird by default, almost as if it's pixelated. Turn on "Force Texture Filtering" to resolve this. The graph below charts the compatibility with New Super Mario Bros. Wii since Dolphin's 2.0 release, listing revisions only where a compatibility change occurred. r7357 Mac OS X 10.6.6 AMD Athlon 64 X2 4000+ @ 2.1GHz ATI Radeon HD 4650 Playable: 40-60FPS, OpenGL plugin and recommended settings. 3.5-514 Windows 7 Intel Core i7-2670QM @ 2.9GHz NVIDIA GeForce GTX 560M Full speed with animated textures at certain settings. Use Direct3D11 Backend and JITL recompiler for highest possible performance. To get animated coins, enable "EFB Copies" to "RAM", set "Texture Cache" to the middle, and turn on "Cache Display Lists". Make sure that "OpenMP Texture Decoder" is disabled (it oddly halfs performance with this game in DX11). You will likely have to turn your internal resolution down to 1x or 1.5x for full speed. To increase the resolution without decreasing performance, disable EFB Copies or set them to Texture. Rotating coins and animated textures will no longer be animated. 3.5-1371 Debian 7 AMD Phenom II X3 720 @ 2.8GHz NVIDIA GeForce GT 520 EFB copies to texture, blue coins not visible, coins not animated. Half of the game levels play at near full speed, with occasional stuttering. Levels with lava have more stuttering. Underwater levels and sand levels are very slow and barely playable. The last section, with King Koopa, is barely playable. 4.0-1963 Windows 7 AMD FX-6300 @ 3.5GHz AMD Radeon HD 7990 Stable 60FPS @ 4x internal resolution + 16x aniso. EFB copies to RAM makes blue coins visible, but it makes a huge speed drop, even at 1x internal resolution. (15-25FPS). 5.0-rc-33 Mac OS X 10.10.3 Intel Core i5 @ 3.3GHz Intel Iris I mostly use this setup for testing custom levels. Pretty good FPS, but a lot of stuff is either invisible or not animated because I'm using EFB to Texture Only. I also use OpenGL/AL, 1x Native resolution, no anti-aliasing, 1x Filtering and Scaled EFB copy. 5.0 Windows 10 Intel Core 2 Quad Q6600 @ 2.4GHz NVIDIA GeForce 550 Ti Perfectly playable, even with this somewhat old PC. Full speed at all times at 60 FPS with minor or no glitches at all. This page was last edited on 11 August 2018, at 10:38.